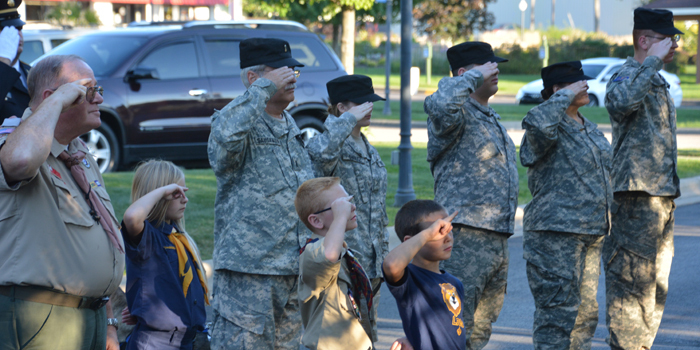 Military personnel and Cub Scout Pack 3736 salute during the presenting of the colors at the 9/11 ceremony. WARSAW — Kosciusko County residents, law enforcement and military personnel gathered at Central Park at 6:30 p.m. today to remember the 17th anniversary of 9/11. The ceremony was organized by the Kosciusko County 9/11 Memorial Remembrance Committee and was held at the 9/11 memorial at the park. In comparison to previous years, the ceremony was abbreviated due to personal conflicts not allowing the Remembrance Committee to meet often to plan the event. After the presenting of colors by the Indiana Guard Reserve, Bryce Lippe sang the National Anthem. Cub Scout Pack 3736 led the Pledge of allegiance. 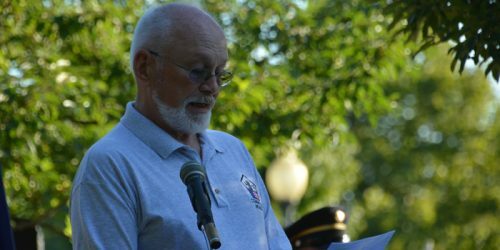 Mike Cox, Kosciusko County 9/11 Memorial Remembrance Committee member, was the main speaker of the event. The remembrance ceremony concluded with a prayer by Ken Locke and a moment of silence. 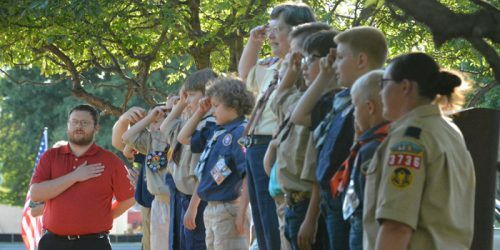 Cub Scout Pack 3736 led the crowd during the Pledge of Allegiance. Mike Cox speaks during the ceremony.